Just wanted to say that your company exceeded expectations since you delivered a day earlier than promised and my son, an auto mechanic, was able to finish the truck a day sooner. Thanks. 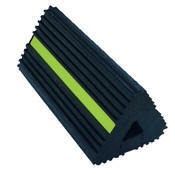 Have questions or need more information about our 'Molded Rubber Chock with ergonomic-style handle', please contact us?